As one of the four major tournaments in tennis, the French Open is more than an opportunity for players to etch their names in the history books—it’s the perfect chance for sportswear brands to take center stage as the whole world looks on. Throughout the rich history of Roland Garros, we’ve seen on-court style evolve from fashion-forward to performance-heavy. Where the ‘70s, ‘80s and ‘90s were dominated by bold and colorful ensembles, these days players are more concerned with the performance edge they can gain from their respective gear. Still, as tennis fans, we’ve witnessed the best of both extremes over the decades. 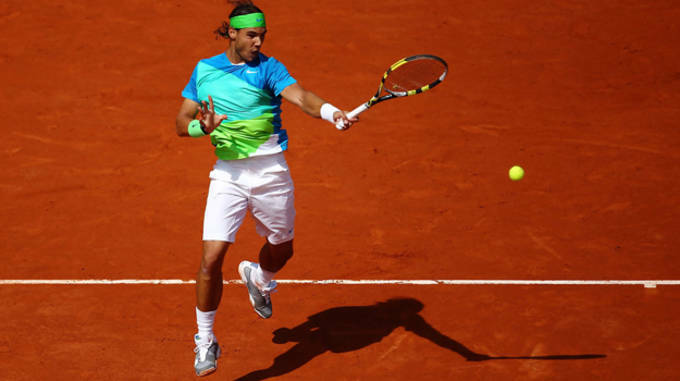 With the 2014 French Open in full swing, we take a look back at some of the most memorable outfits worn on the iconic clay courts at Roland Garros. You simply don’t see enough argyle print on the tennis courts nowadays, particularly at the French Open. 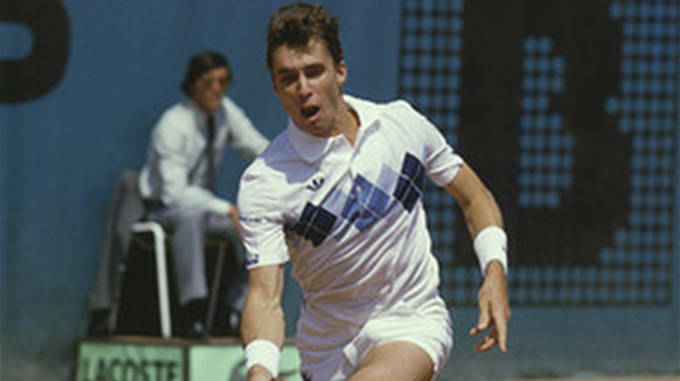 However, that wasn’t the case back in the ‘80s when Ivan Lendl was holding it down for adidas. 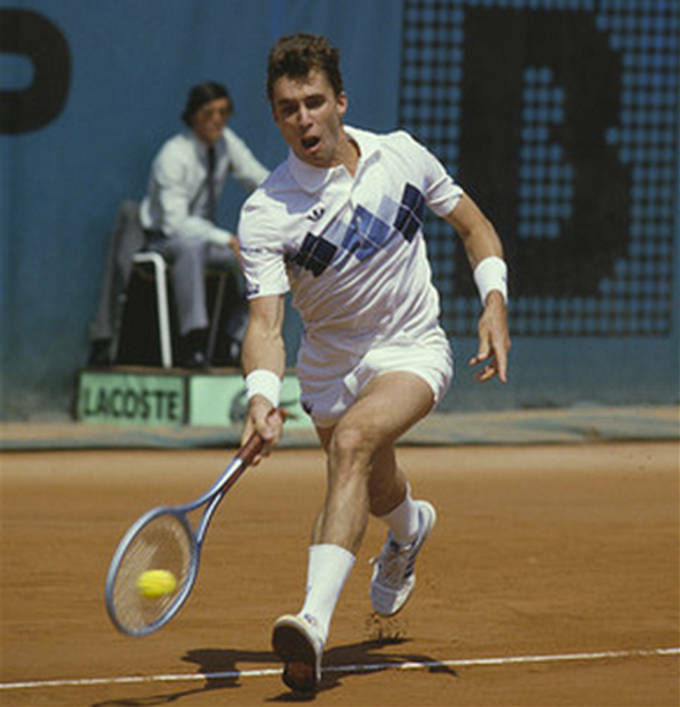 During his French Open championship run in ’84, Lendl took to the clay in a white polo with a blue argyle print across the chest. It was the perfect top to compliment his white/blue Lendl Pro signature sneakers from adidas. That was then—back when adidas still branded its performance apparel with the trefoil logo that is reserved exclusively for its lifestyle line today. While adidas still has a strong presence at Roland Garros, you’d be hard-pressed to see players step out onto the red stuff in their whites. It was just a couple of years ago when Japanese fashion brand Uniqlo decided to delve into the world of tennis. Already, the brand has locked up a couple of high-profile endorsers in Novak Djokovic and Kei Nishikori. 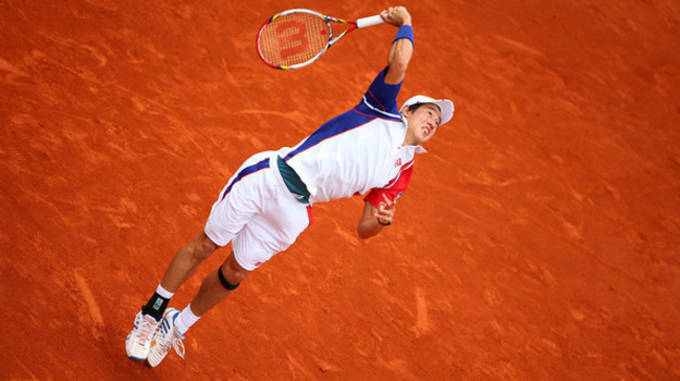 In 2013, Uniqlo outfitted Nishikori with a classic red/white/blue look that was sort of an homage to the French flag, and in terms of style, worked on so many different levels.. The white shirt and pants contrasted the red clay with perfection, while the color-blocked sleeves brought a modern touch to the outfit. Unfortunately Uniqulo doesn’t manufacture tennis shoes (yet), so Nishikori opted for a pair of adidas Barricades that year. 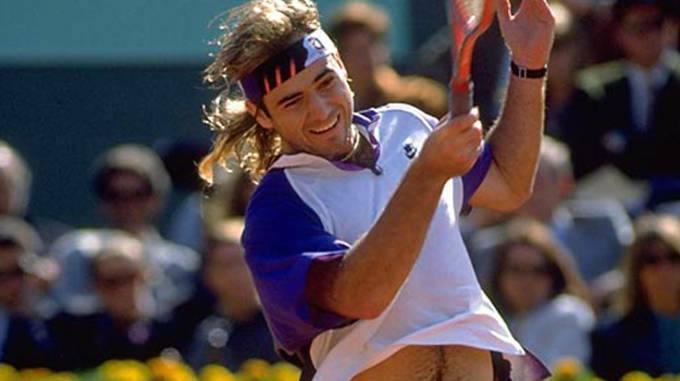 Agassi’s ensemble for the 1991 French Open was indicative of the way brands approached tenniswear in the ‘90s. Performance took a back seat to panache and vibrant colors and bold patterns ran rampant. This was a time—thanks to guys like Agassi—when tennis sneakers were recognizable beyond the lines of the tennis court. Every sneaker enthusiast wanted to lace up in Agassi’s Nike shoes. In ’91, Agassi took Roland Garros by storm in a pair of his signature Air Tech Challenge sneakers. The purple/white shoes complimented the rest of his Swoosh-branded outfit perfectly. 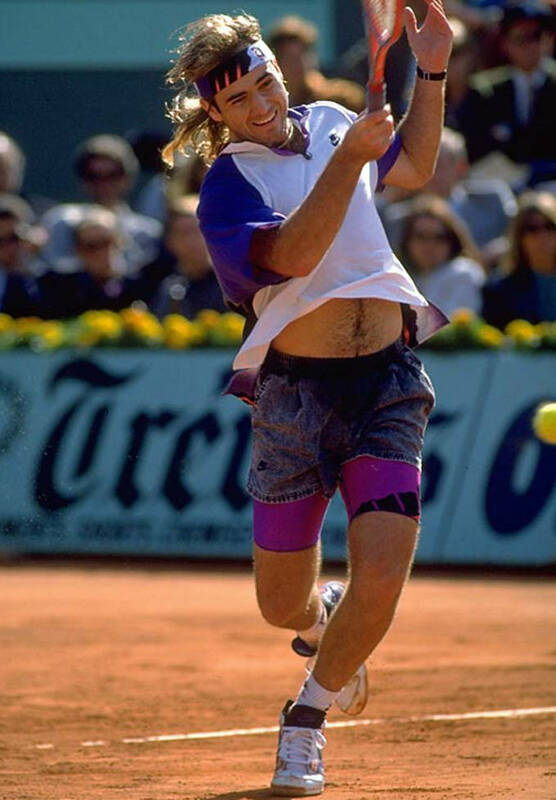 There was the purple/white color-blocked polo, paired with that denim cutoff/spandex combo that Agassi became known for. Agassi would go on to lose in the final to fellow American Jim Courier, but not before he left showcased the best of what Nike Tennis had to offer at the time. Roger Federer is arguably the greatest tennis player of all time. So it should come as no surprise that he gets the royalty treatment from his numerous endorsers, including Nike. Over the years, the Swoosh has spared no expense in making sure their ace always looks his best on the court. In fact, he gets a new outfit ahead of each of the four major tournaments. 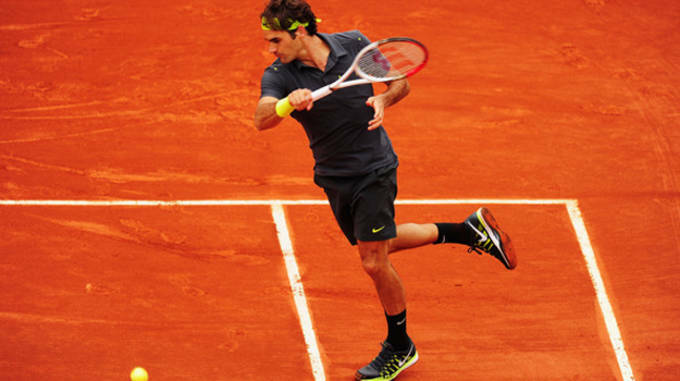 While we’ve seen a lot of good style choices from R-Fed over the years, when it comes to the French Open, his 2012 outfit ranks amongst the top. Leaving his whites at home, Roger opted for a blacked-out ensemble that featured subtle volt highlights. There was nothing flashy about the outfit, but Federer managed to make it work in a way that only he can. The bright bandana and detailing on his Zoom Vapor 9 Tour sneakers complimented the black polo and shorts to a tee. Frenchman Jo Wilfried Tsonga has yet to win a major tournament in his career, but that hasn’t stopped adidas from exploiting his full marketing potential on a global scale. 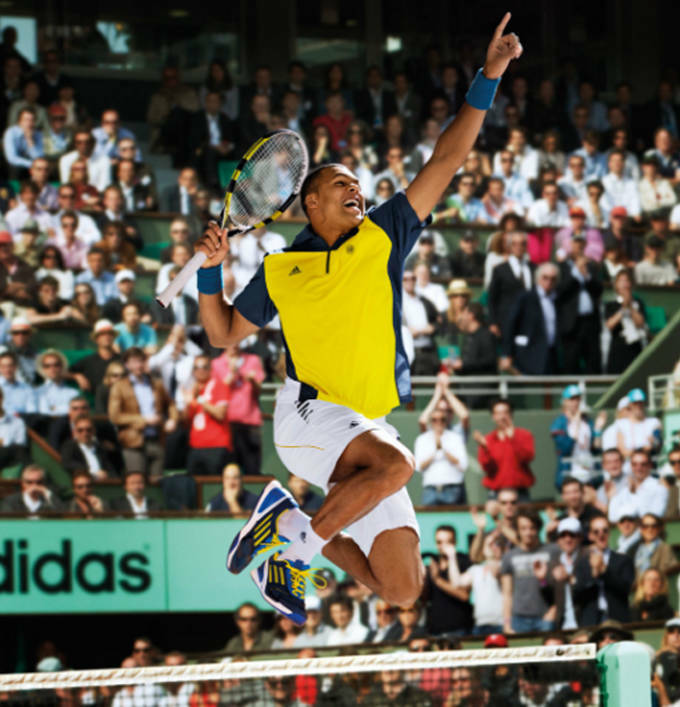 For the 2013 iteration of the French Open, adidas hooked sixth-ranked Tsonga up with his own signature apparel collection that included a multi-colored Roland Garros Polo, Roland Garros edition shorts and a pair of the adizero CC Feather II sneakers in a matching navy/gold/white color scheme. Not only did he look fresh in his signature attire, Tsonga played exceptionally well on the clay as he advanced to the semifinal round—his best result thus far at the French Open. With a majority of the top 10 players on tour rocking a Swoosh or the Three Stripes these days, Fila’s iconic logo often gets overlooked. Though, there was a time when the brand was at the forefront of the tennis apparel market. In the 1970s, Fila, who primarily produced underwear at the time, moved into sportswear. And with a little help from tennis great Bjorn Borg, became iconic both on the tennis court and in mainstream culture. 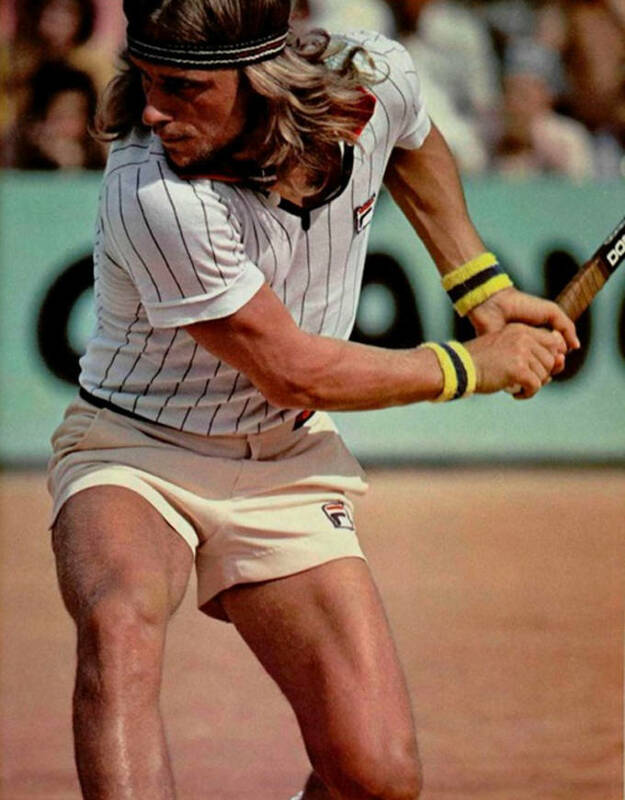 Heading into the 1979 French Open, Fila outfitted the top-ranked Borg in a classic pinstripe polo and a pair of tan shorts. 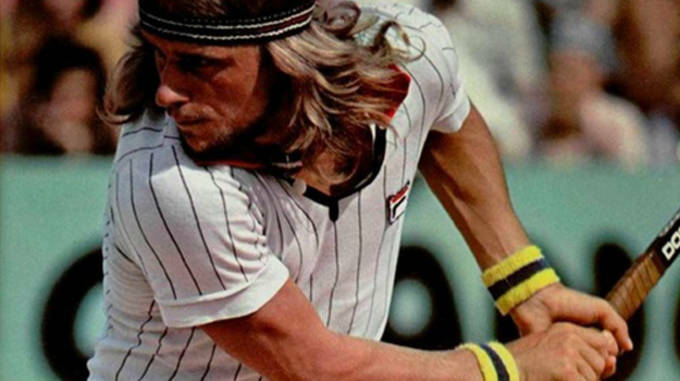 The pinstripe look became synonymous with the Swede—that and his trademark headband that held back his golden locks. Borg would go on to win his fourth career Roland Garros title that year, and ended the season atop the year-end rankings. The advancement in technical fabric has found its way into the sport of tennis over the past couple of decades. Where the ‘80s and ‘90s were all about style, today, players and their respective kit suppliers are more focused on enhancing performance. 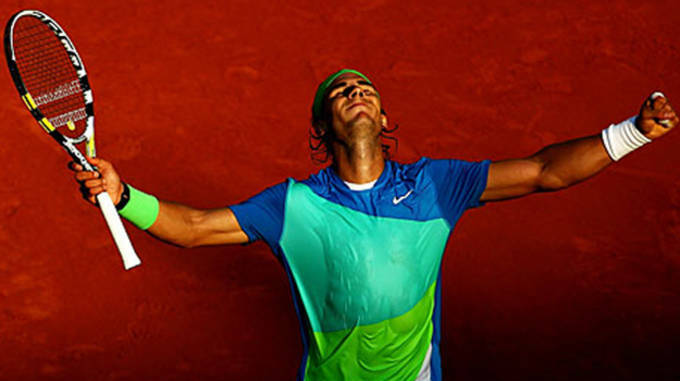 Take Rafael Nadal’s many looks from Nike for example. As they do with Roger Federer, Nike supplies Nadal with a new ensemble prior to every major tournament. Like Fed, Nadal has a signature like with the Swoosh—one that includes techwear tees and some of the most advanced sneakers the tennis world has ever seen. During his early days as a pro, Nadal’s style was absolutely horrible. The color choices for his outfits almost always fell flat, and those horrific Capri pants didn’t help his cause much either. Fortunately, that’s no longer the case for the top-ranked men’s singles player in the world. A few years back at the 2010 French Open, Nadal lit up the court with more than his sweeping forehand; his colorful green/blue/white tee and white zipper planchet shorts stole the show at Roland Garros. The casual look was a departure from the classic polo look tennis fans had become so accustomed to. On his feet, Rafa rocked the Nike Ballistec 2.3 in a matching colorway. He would go on to ride that look all the way to the top of the podium. 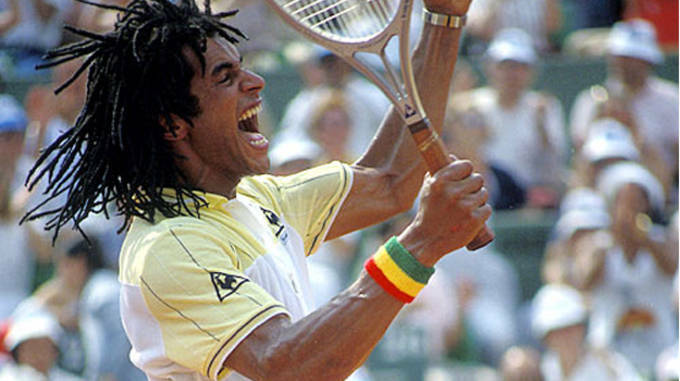 In 1983, Yannick Noah—yes, the father of NBA player Joakim Noah—became the first French player to win at Roland Garros since fellow countryman Marcel Bernard did it 31 years prior in 1946. That year, Noah also wore one of the best outfits in the tournament’s rich history. At a time when Le Coq Sportif was mostly known for its cycling gear, Noah helped put the brand on the map in the booming world of tennis. The brand’s use of color blocking paired with Noah’s exuberant personality made the Le Coq logo a huge success in the sport and beyond. During that aforementioned ’83 French Open championship run, Noah hoisted the trophy in all-Le-Coq-everything. From that slick color-blocked polo down to his sneakers—it all boasted the Coq. Even his LCS racket was made by the French brand. Just a few years after his unlikely win at Roland Garros, Noah would go on to become a part owner of Le Coq. 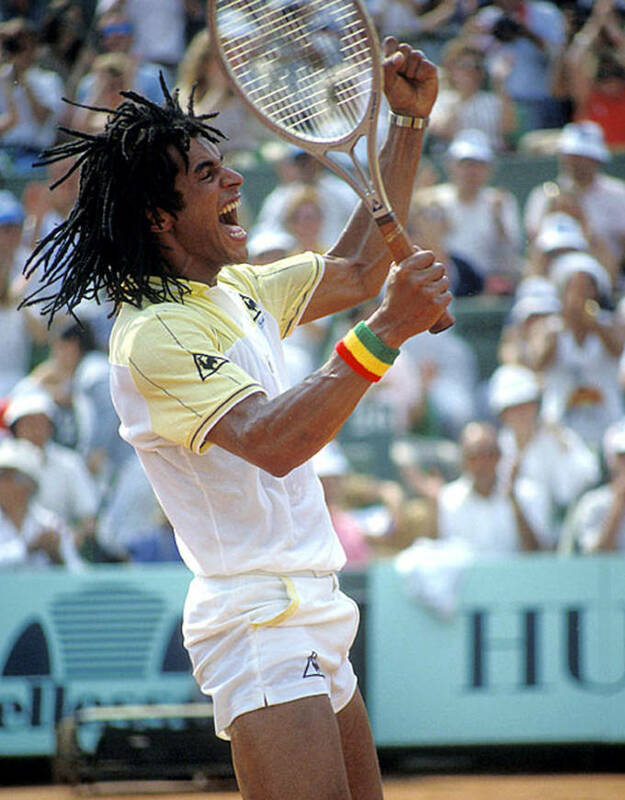 Oh by the way, 31 years later the French are still waiting for a homegrown champ. Andre Agassi took tennis to new heights with more than just his playing skills—he also revolutionized the way the rest of the world viewed tennis apparel and footwear. 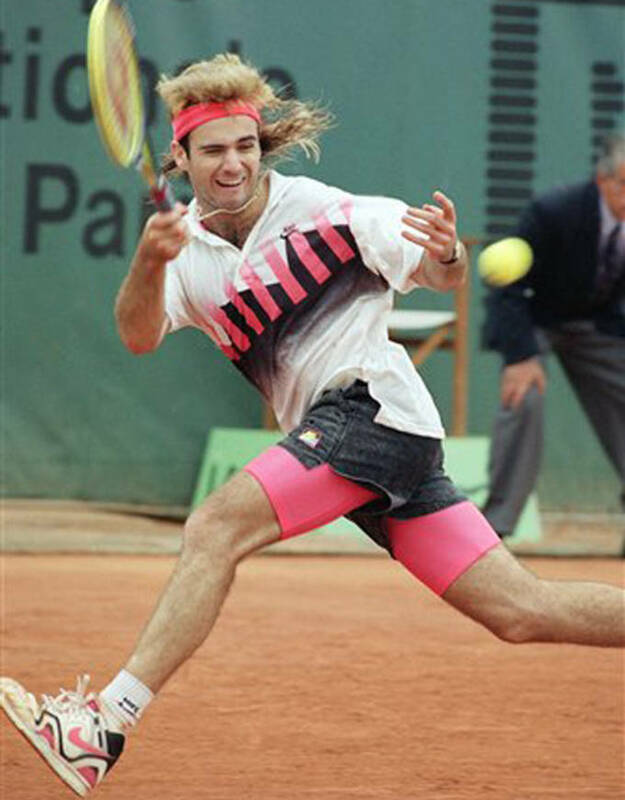 A man known for his flair, Agassi wore one of the most memorable get-ups tennis had ever seen at the 1990 French Open. 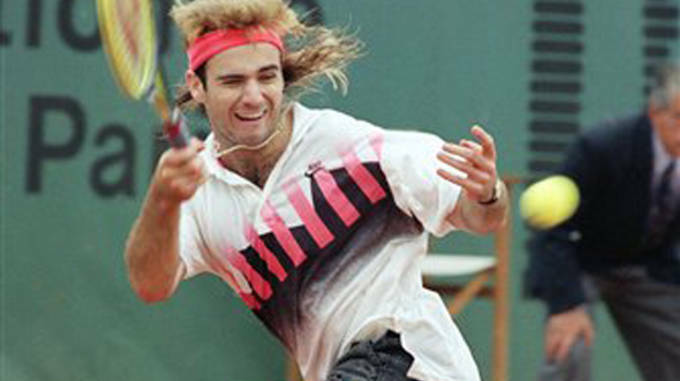 A Nike man through and through, Agassi took to the court in a polo that featured bold hot pink vertical stripes, neon pink Day-Glo spandex tights under his denim cutoffs, and a hot pink bandana to hold his wig back (yes, the man himself admitted to wearing a Farah Fawcett-type wig in the early ‘90s). His outfit was the epitome of the ‘90s athletic wear—where performance took a backseat to fashion. To be fair, though, his Air Tech Challenge II’s were some of the best tennis shoes of the time. In fact, they’re still regarded by many as some of the most iconic tennis sneakers ever created.